The Legal Genealogist is off to Maine this weekend for the Maine Genealogical Society’s 2016 Annual Fall Conference in Brewer — and am sure hoping to see many friends old and new at the conference. But of course that means I was was poking around in old Maine statutes last night, and in doing so came across a law that started me thinking. What about the names we see on a militia list there? What do we know about those men? Now you already know where I’m going to start with this particular question. As usual, I want to look at the laws. And not just because I was poking around in the statute books, but because the laws can often explain the records we’re seeing — or not seeing. Or, in this case, the names that are or aren’t on a list. The federal government passed several militia acts after that one, but none that changed the basic requirement. Put it altogether and what does it tell us? 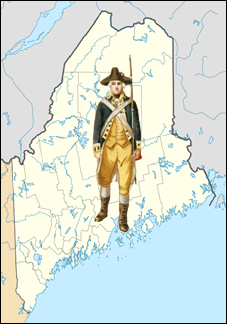 It tells us that we should find the men of Maine on a militia list where they live as long as they were between the ages of 18 and 45. Not on the list? Probably under 18 or over 45. It tells us that some men won’t be on the list even if they were the right age. Not on the list? Check the rolls of the Quakers or the Shakers, or the ordination lists of the churches. It tells us that some men won’t be on the list even if they were the right age and laymen of ordinary denominations. Not on the list? Check the occupations: were they postal employees? Stage drivers? Or, of course important in Maine, were they mariners? In this, as in many similar issues, the answers to the names on the list — or not on the list — will be found in the law. I’ve learned so much about Maine these past few days. Many of my ancestors lived there. I’ve been looking for maps, OLD maps, of those eastern territories and states to make it easier for me to figure out where some place really was. Try Historic Map Works. As an example http://www.historicmapworks.com/Map/OL/1402/ is a copy of an important and famous map of Maine from 1820. I have a entire book on this mapmaker and his work. You can also get incredibly detailed atlases – several of my ancestor’s houses are marked in the Larrabee Cove, Machiasport area of http://www.historicmapworks.com/Map/US/70521/Machias++Marshfield++Whitneyville+Z/Washington+County+1881/Maine/. Their coverage is not limited to the northeast, I’ve used a similarly detailed map of Ohio in working on another line of my ancestry. I appreciate your parsing the law for us and how we can use it to identify and name our ancestors. Thank you.